Please note; Price includes both the sound moderator and the rail, but not the bipod. This Tikka T3 is in as new condition. We have inspected the bore and it is perfect condition. COMPLETE RIFLE AS SHOWN. FITTED WITH A LEUPOLD SCOPE AND MOUNTS. WE HAVE INSPECTED THE BORE AND CONFIRM THAT IT IS IN PERFECT CONDITION. 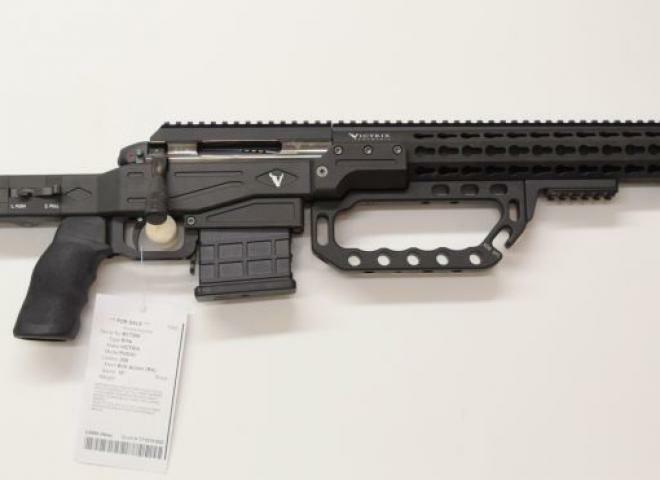 The latest M&P semi auto rifle. 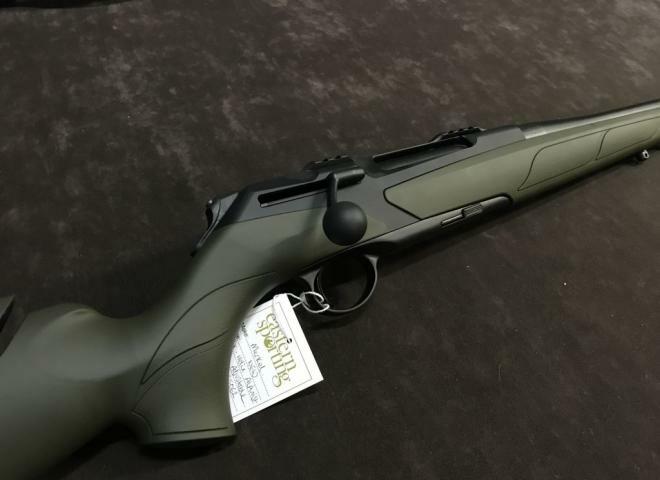 The Latest Ruger tactical .308. comes with 2 magazines, new tactical forend, new metal bolt housing and muzzle brake.- In stock now. Ready to purchase. Finance Now available with 12,24 or 36 month terms. New Tikka T3X 6.5mm creedmoor 20"
Cooper arms single shot model 22 new walther match grade varmint barrel fitted threaded 18x1 fully bedded in to a mcmillan stock .Only proof shot and 20 test rounds very accurate rifle. All in very good condition with SS MEA moderator. lee enfield mk 4 new criterion barrel fitted when i bought it , also has parker hale iron sight . accurate rifle and in nice condition , comes with 3 mags. Good overall condition comes with canvas sling , over 100 years old now and still hits the bull . This gun is in Mint condition. I bought this from a gun shop in mint condition 18 months ago and have fired less than 50 rounds through it. I can prove this on my licence. Only selling due to having no time to use. Medwell & Perrett .375 H&H Made in Suffolk, England. Built around a Mauser 98 Action. Very good condition, this iconic model is made by Karl Walther Germany. Purchase with confidence from a family run business with over 30 years experience. Includes Sak S/Mod and Hawke 3-9x50 sport HD scope. Good condition. Fitted with picatinny rail and Shield CQS Red Dot sight with 2MOA dot (£250 new price). Excellent rifle in as new condition, just right for some long range bunny bashing.. Comes with a Free sound moderator if the buyer has authority to possess and is fitted with a hawk scope. 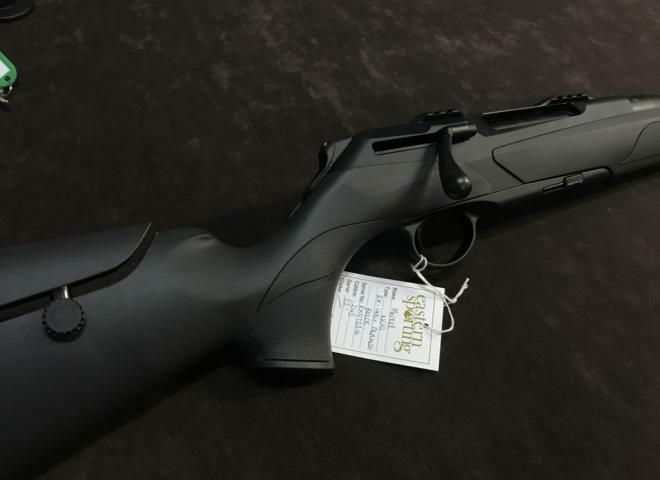 This Savage 110 BA Stealth in 338 Lapua magnum was bought by myself in May 2018 when it had just been released in the UK. Unfortunately I haven't had time to shoot it as much as I'd like and a house move forces sale. Amazing condition as its barely used, looks and feels like its straight out the box! Moving house and so having to downsize the cabinet. The scope is also in mint condition. Comes with everything in the picture. Very good condition, used for about 500 rounds. 2 x 24 round banana clips for ultimate rabbit hell! Good fun little gun but need to clear out space due to moving house. I am reluctantly selling my L1A1 as i am not using it sufficiently to warrant keeping it. New firing pin just installed. Alot of fun but getting something bigger. Hard Case, Original Box, Scope, Moderator, Iron Sights, 25 and 10 round mag and Red dot Sight all included. Nice little .17 HMR mint condition, original box, moderater, 10 round mag, Hawke Vantage scope and william evans gun bag included. Only had one owner before me and only had about 70 rounds ever put through it. 22 inch Barrel with flip up sight. Laminate Stock - 1/2 UNF Threaded Heavy 16" Barrel, complete with Sak Sound Moderator and Hawke AO MD IR scope all for £450. Long range rifle screw cut brand new rifle , bought 2 years ago but as never been used , I have arthritis of the spine and the gun is just to heavy for me. The doctor say it’s only going to get worse . I just hope someone can enjoy it . This is a secondhand heavy barrel 223 howa. Rilfe has new GRS stock and picatinny rail to mount scopes barrel is threaded 5/8 unf. Bore is good on rifle but there are a few pits on the barrel. Rifle has a few scratches on stock, bore in good condition it's not been used a lot. 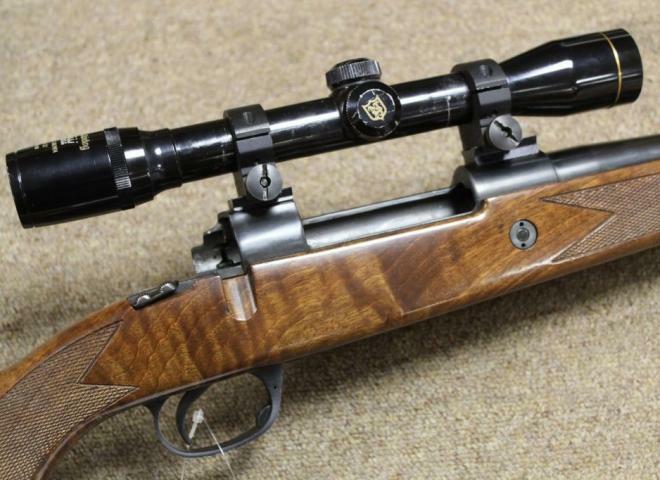 This is a secondhand sako A2 forester in 243 calibre. Rifle has been used but shoots very well and is still very accurate even for being old show you the quality in these guns . Remington 700VSF Stainless steel fluted 26” barrel with pepper pot and GRS Hybrid Stock. 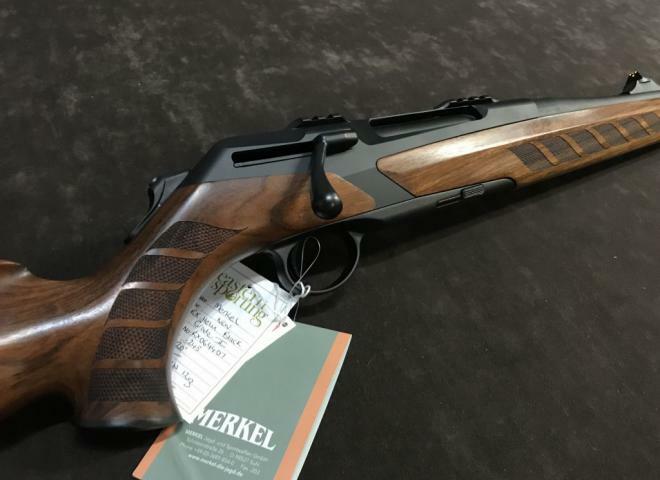 Eastern Sporting - Merkel Premium dealers for the South East. Black stock with integrated picatinny rail. 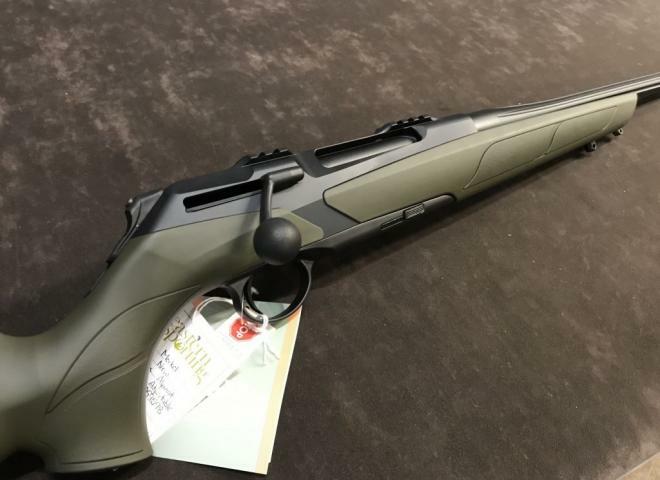 Brand new Merkel Helix Alpinist chambered in .308. Green stock with integrated picatinny rail. Black stock model with integrated picatinny rail and adjustable comb. Beautifully figured high grade walnut stock with cheek piece detail. 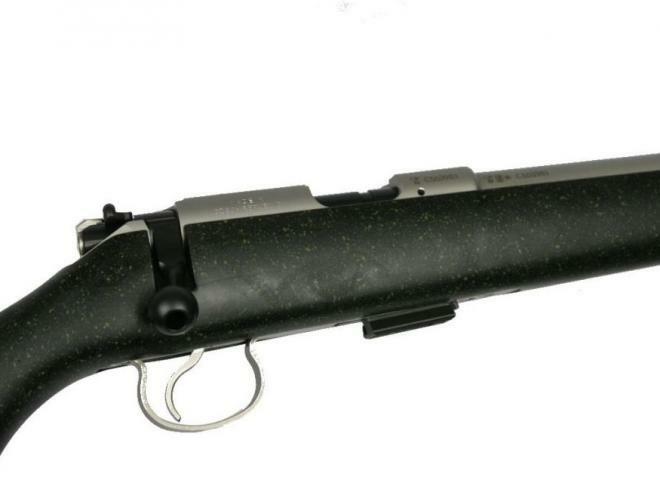 Green stock, fluted barrel with integrated picatinny rail. Brand new Merkel Helix Speedster chambered in .308. With Bushnell High contrast 3-9x40 scope and mounts, sound moderator andsling. A very tidy untouched stainless M77 with heavy varmint barrel and laminated stock. Price includes 25mm Ruger stainless rings and Wildcat Predator 8 sound Moderator. Includes SAK moderator and Hawke Fast Mount. Very clean rifle in good condition, would make a great vermin gun. A virtually new stunning outfit. Round count is 60. Comes with a Hawke Frontier 30. 5-30X50 scope and Warne mounts.CSW Piccatinny rail, Wildcat Panther .17 sound moderator. very nice laminated stock. Condition is as new. 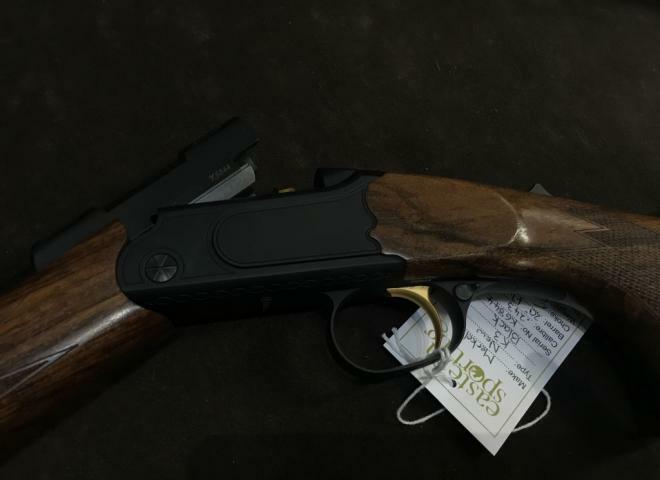 Blaser R93 Luxus stock, left handed rifle. The wood on this rifle is stunning, not a single scratch on her she is prestine. Fitted with 243 barrel, it can be supplied with the Calibre of your choice.